(Nanowerk News) Moore’s law — the well-known doubling of computer chips’ computational power every 18 months or so — has been paced by a similarly steady increase in the storage capacity of disk drives. In 1980, a hard drive could store about a half-megabyte of data in a square inch of disk space; now, manufacturers are closing in on a million megabytes of data per square inch. Moreover, where previous schemes required sandwiching the storage molecules between two ferromagnetic electrodes, the new scheme would require only one ferromagnetic electrode. That could greatly simplify manufacture, as could the shape of the storage molecules themselves: because they consist of flat sheets of carbon atoms attached to zinc atoms, they can be deposited in very thin layers with very precise arrangements. The storage molecules were developed by chemists at the Indian Institute of Science Education and Research in Kolkata, who are co-authors on the Nature paper. The Indian chemists believed that the molecules could be useful for the type of experimental devices studied by Moodera’s group, which use “spin,” a property of tiny particles of matter, to represent data. Under Moodera’s supervision, Karthik Raman, then a PhD student in MIT’s Department of Materials Science and Engineering and now a scientist at IBM’s Research Lab in India, and Alexander Kamerbeek, a visiting student from the University of Groningen, deposited a thin film of the material on a ferromagnetic electrode and added a second ferromagnetic electrode on top — the standard structure for magnetic memories. The idea is that a relative change in the electrodes’ magnetic orientations causes a sudden jump in the device’s conductivity. The two states of conductivity represent the 1s and 0s of binary logic. To their surprise, however, the MIT researchers measured not one but two jumps in conductivity. That implied that the electrodes were changing the device’s conductivity independently. “According to the common knowledge, this shouldn’t happen,” Moodera says. To confirm their intuition, the researchers performed the experiment again, but instead of using two ferromagnetic electrodes, they used one ferromagnetic electrode and one ordinary metal electrode, whose only purpose was to read the current passing through the molecule. Indeed, they found that the jump in conductivity still occurred. As Moodera explains, the ability to alter the molecules’ conductivity with only one electrode could drastically simplify the manufacture of molecular memory. The bottom electrode of a memory cell can be deposited in a perfectly flat layer and the storage molecules layered on top of it. But if the next layer to be deposited is the top electrode, its molecules will tend to mingle with the storage molecules. If the electrode is magnetic, that mingling can compromise the performance of the cell; if it’s metallic, it won’t. In an alternate design, the top electrode is a tiny tip, like the tip of an atomic force microscope, positioned less than a nanometer above the storage molecules. But again, a magnetic electrode poses problems — in this case, by limiting how densely the storage cells can be packed. If they’re too close together, a magnetic tip might change the magnetic orientation of cells adjacent to the one it’s intended to address. That’s not a concern with nonmagnetic tips. The shape of the molecules themselves could also simplify the manufacture of molecular memory. Typically, experimental molecular memories consist of five or six layers of molecules sandwiched between electrodes. If those molecules are properly aligned, they exhibit large swings in conductivity, but if they’re not, they don’t. Ensuring their proper alignment is another labor-intensive process. The molecules developed by the Indian researchers, however, consist of zinc atoms attached to flat sheets of carbon, which naturally tend to align with each other. 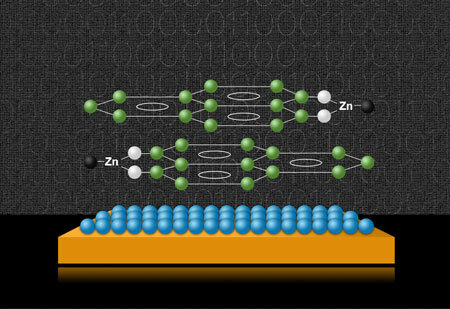 The MIT researchers also showed that two layers of the molecules were sufficient to produce a memory cell. “If you put a whole bunch of molecules between the electrodes, it’s harder to control,” Moodera says.